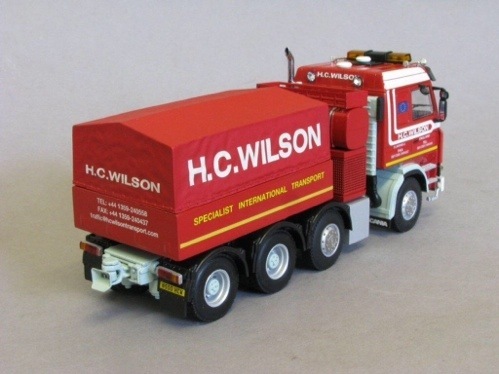 Promotional model trucks specialist Search Impex is pleased to announce the release of the second model in the Haulage Heavyweights collection of solo tractor units. 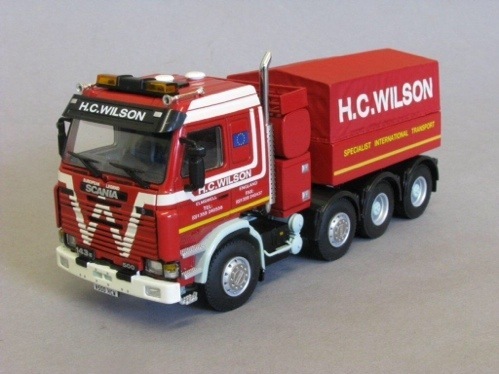 “European Legend” – a Scania 143E (8×4) tractor unit, complete with ballast box, is customised in the livery of Suffolk based heavy haulier H C Wilson Transport. The model has been produced exclusively for Search Impex by WSI Collectibles as a certificated Limited Edition (155 pieces). 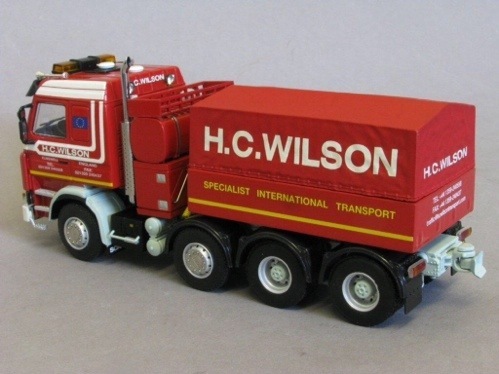 Established in the early 1960’s, H C Wilson was initially involved in the transport of hay and straw. Involvement in this sector of the market led to the haulier being approached by Vicon (an agricultural machinery manufacturer based in Ipswich) wanting machinery to be transported to their customers. As a result of undertaking this work, H C Wilson received requests from other machinery manufacturers and the business soon found itself transporting agricultural machinery throughout the British Isles. As business developed, H C Wilson went on to establish a reputation for their work in the complexities of importing combine harvesters from France. As the size and weight of the combines increased so, too, did the need for larger and more specialised trucks and trailers on which to transport them. The need to start moving new 12ft wide Massey Ferguson machines saw the Company becoming involved in designing bespoke trailers and looking at purchasing bigger tractor units – and so began the evolution into the abnormal load market. A steady expansion of the business from its humble beginnings also saw a growing demand for wider reaching heavy haulage contracts and so, in 1979, a strategic decision was made to move towards heavy haulage. This resulted in the purchase of a new Scania 141 62-tonne tractor (EGV 565T) and a Broshuis three-axle 35-tonne payload semi low trailer. to an 8×4. “European Legend” – a factory built 160-tonne 8×4 Scania 143E (registration N500 HCW) joined the fleet in 1996 and although now semi-retired remains fully maintained and capable of working, if required. The Company now operates 30 vehicles and 60 trailers and is one of the UK’s leading heavy hauliers. They are also among only a few heavy haulage specialists willing to work not only in the UK, but also throughout Europe and beyond. Models, available from Search Impex, are priced at £103 each (including UK delivery & VAT). 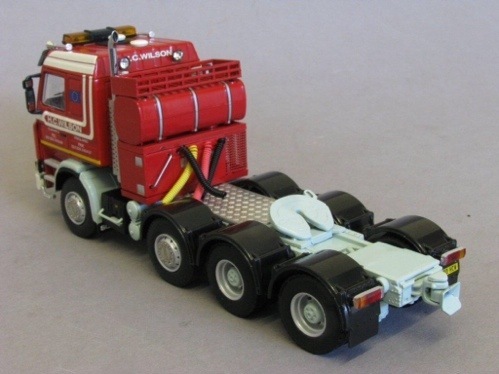 For details of availability of this and other models, collectors can visit the Search Impex website at www.search-impex.co.uk or call on 01332 873555. 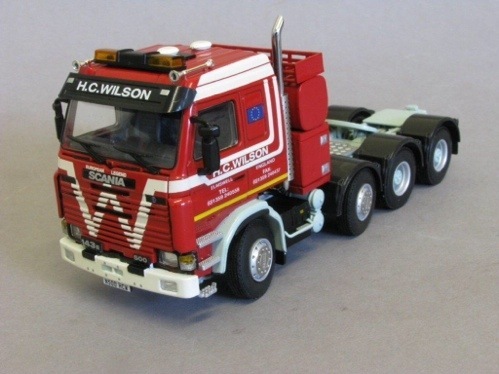 This entry was posted in For Sale, HC Wilson, Heavy Haulage, Models, NEWS, Scania by truckbloguk. Bookmark the permalink.